Published on 21 June 2011, in the blog Acclaro - Translating Global Business, in an article on spending four hours in Buenos Aires. Specifically, a bookstore that was at one time, a theatre where the finest tango dancers performed, El Ateneo. Seating over 1,000, El Ateneo served as a showcase for famous Argentinian tango singers and dancers including Carlos Gardel, Francisco Canaro, Roberto Firpo and Ignacio Corsini. In the early 1920's it served as location for some of their earliest recordings. By 1929 it had been converted into a cinema playing the first films featuring sound in Argentina. Having been updated into a book and music store, the stage now serves as a cafe'. 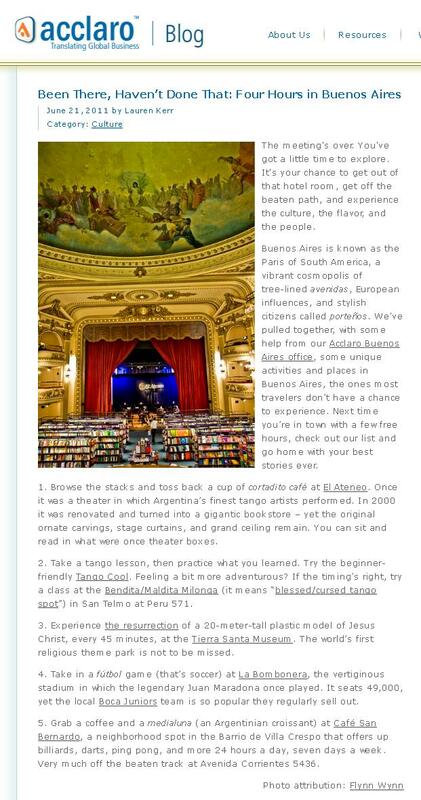 In 2008, El Ateneo was cited by The Guardian as one of The World's 10 Best Bookshops. BONUS! Clickity click for more from Buenos Aires.